What was the original timetable for the arena, and how did it change? When the project was announced in December 2003, the (preposterous) claim was that the arena would open in the fall of 2006. When the project was officially approved in December 2006, the arena was supposed to open in 2009. The developer and the ESDC slowly and reluctantly nudged the timetable back to 2010, 2011, the 2011-12 season, and now 2012. Will the arena definitely open in 2012? Well, if construction starts now and there's a 28-month construction period, the arena should open in July 2012, with much lead time for the team to open the season in October. That said, the two-year lease in Newark has a reported two-year extension, and both the Newark mayor and an NBA officials have acknowledged that the Nets could be at the Prudential Center for two-to-three years. What about the first towers? According to an article in the past week's Courier-Life chain, the first of three residential buildings is scheduled to start in the summer 2011, with the second building six to nine months after that, and the third six to nine months after that, according to FCR spokesman Joe DePlasco. While p.r. for the groundbreaking stated that the "first phase" will start this year, that refers to design work, not construction. Then again, affordable housing depends on subsidies, and the Development Agreement requires only 300 affordable units in Phase 1, with 12 years to get it done. Though there are penalties for delays on specific buildings, the developer also can ask for eight one-year extensions based on unavailability of subsidies. The developer also can claim a market financing unavailability for certain towers. It's supposed to take a decade. But the developer has 22 years to pay for the railyard at issue, and 25 years to build the project before penalties--not tied to specific buildings--kick in. Are there renderings of any other parts of the project? Nope, just--to quote Field of Schemes's Neil de Mause-- "vaportecture." Who's working on the towers? We don't know. However, after once telling Frank Gehry he had to design each tower--likely as a selling point for the project--the developer now reportedly wants a different architect for each one. Actually, no. While the eminent domain litigation is over, decisions are awaited in two pending cases. One challenges the Empire State Development Corporation's (ESDC) September 2009 approval of the project. Oral argument was heard in January and a decision is imminent. The same judge, Supreme Court Justice Marcy Friedman, also has before her a case raising many of the same issues that were dismissed by Justice Abraham Gerges in his decision last week on condemnation, notably that the benefits of the project had changed so much the ESDC should have issued a new Determination & Findings to pursue eminent domain. What if a ruling goes against the ESDC? Clearly, given the planned groundbreaking tomorrow, the ESDC and Forest City Ratner anticipate rulings in their favor and, given the broad deference that judges give legislatively-created agencies like the ESDC, that confidence is unsurprising. If Friedman rules in favor of the plaintiffs, expect a quick appeal. Will the arena be a money-loser for the city? For the state? According to the New York City Independent Budget Office, the city would lose $39.5 million, or $180.5 million when opportunity costs were factored in. The combination of subsidies and tax breaks, including $194 million in federal tax breaks on tax-exempt bonds, adds up to what the IBO calculates as $726 million in savings on the arena for developer. The IBO limited its analysis to the arena. The ESDC responded by saying it considers the whole project; here's the IBO's rebuttal. Will the project bring in $6 billion in new tax revenues? That was the notorious $6 billion lie touted by sports economist Andrew Zimbalist, modified to $5.6 billion and $4.4 billion (net), touted in legal papers by FCR executives and a lawyer as a state estimate--but later withdrawn. The most recent estimates by the ESDC suggest nearly $1.2 billion in net revenue, but that depends on an unrealistic ten-year buildout of the project, highly doubtful office jobs, an unlikely full buildout of the project of nearly 8 million square feet (the development agreement allows for a much smaller project, less than 5.2 million square feet) and a likely underestimate of costs. Will the project include 15,000 construction jobs or, as the developer's more recent promotional material contends, 17,000 construction jobs? No, it would be 17,000 job-years, or 1700 jobs a year for a decade--or, if the project takes 25 years, 680 jobs a year. (The ESDC says 16,427 new direct job years.) And that's only if the project is built as announced. It could be some 44% smaller--and thus the figure for jobs could be much, much lower. Would there be 8000 permanent jobs? 4000? There were once supposed to be 10,000 jobs, a figure that was bogus from the start. The figure of 8000 jobs promulgated by Forest City Ratner relies on a completely unrealistic configuration of office space, for which there is no market. The ESDC's current estimate of about 4000 jobs should be discounted by one-third given the office market. Building service and retail jobs would be dependent on a full buildout of the project, and also could be cut significantly. Would affordable housing be affordable to the "real Brooklyn"? Maybe half of the 2250 units. A good number of the rest would come close to--or be above--market rates. Is it realistic to assume that the market-rate housing would be absorbed in a decade, as the state insists? Only if you believe a KPMG report to the ESDC that contains lies about the current condo market and projects prices for condos of $1217/sf in 2015 and up to $1369/sf in 2019. Isn't the developer going to build a school? A day-care center? A health clinic? According to the Amended Memorandum of Environmental Commitments (aka Memorandum of Mitigation Commitments), which was signed in December, there's a lot of leeway on time for the school, which would not be built by the developer, though space would be conveyed or leased to the Department of Education. Similarly, delays are allowed for the day care center, and services can be contracted. The health care facility could take 12 years. Did Barclays pay $400 million for naming rights over 20 years? $200 million? The $400 million figure was widely reported in 2007 (and afterward) but a document memorializing it was never made public. The bond offering document indicated that the deal was worth $200 million plus unspecified additional payments to the team. The new figure got far less publicity. Was the sale of naming rights to the Atlantic Avenue/Pacific Street subway station for $4 million over 20 years a "goodly sum? Will the team be called the Brooklyn Nets? That was the term used in initial mailings, but Nets CEO Brett Yormark told an interviewer that, while "Brooklyn Nets” is the team's "working title," and “most people assume it’s going to be the Brooklyn Nets," owners still must "validate that” with some "research in the field." Last October, reports NetsDaily's NetIncome, a consultant for presumptive Nets owner Mikhail Prokhorov was asking about the name of the city and the team. And if Brooklyn were dropped, Borough President Marty Markowitz would positively plotz--not that the name is his call. And Forest City Ratner would have to explain away that flier they sent back in 2004. Is Atlantic Yards a place? No, it's a project. The railyard owned by the Metropolitan Transportation Authority is called Vanderbilt Yard. Would the project and arena be built "over the railyards"? No, the Vanderbilt Yard is about 8.5 acres, while the project footprint is 22 acres (originally 21). The arena would be built over part of the railyard (less than a third), a city street, and property, once private, bought by the developer under the threat of eminent domain or acquired by the state (using the developer's money via eminent domain. Are the arena and project in Downtown Brooklyn? Was the site rezoned by the city? No, they're in Prospect Heights, though arguably it would extend Downtown Brooklyn. That's important because Downtown Brooklyn was rezoned, and some people think that Atlantic Yards was the product of a rezoning. No, the project would be enacted via a state override of zoning. So there was no public approval by the city. Is the Atlantic Yards site is the same place Dodgers owner Walter O'Malley wanted to build a replacement for Ebbets Field? O'Malley didn't want to build over (and around) the Vanderbilt Yard, but rather across the street, north of Atlantic Avenue, on land now occupied by Forest City Ratner's Atlantic Center and Atlantic Terminal malls. Is Brooklyn still suffering from the lingering wounds caused by the Dodgers' 1957 departure for Los Angeles? Was it true? Had O'Malley crushed Brooklyn's spirit? The answer is no. In 1963, after the Dodgers vanquished the Yankees in the World Series, a New York Times editorial titled Joy in Flatbush declared, "At last the wounds have healed." In 1969, when the New York Mets won the World Series, Brooklyn honored them with a rally at Borough Hall. The victory made the Dodgers seem like ancient history. Is pro basketball in the 21st century much like pro baseball in the 1950s in terms of the players' and teams' relationship to the community? Not really. Back in November, 2005, Scott Turner of Fans for Fair Play savaged the relevance of Dodgers nostalgia in the context of the Atlantic Yards saga, contrasting owners, their devotion to sports, their commitment to local fans, the players, ticket costs, and commitment to local businesses, among other things. Is the project site blighted? Well, the state says it is, under New York State's notoriously vague standards ("substandard and insanitary"), and judges have deferred to the findings of the Empire State Development Corporation. However, the state relied on environmental consultant AKRF, which often works for the developer before it works for the state, and has never not delivered findings that are declared blight. Such dubious findings include citations of weeds and graffiti, or properties built out to less than 60% of their development potential. The crime study was bogus. (More here.) A market study, part of the RFP for the consultant's work, was never done. The site for a huge parking lot borders a historic district. Does the project represent transit-oriented development? Only, says planner Tom Angotti, if any project near transit is defined thusly, given the failure to expand transit capacity. (There would be a new entrance serving the arena block on the south side of Atlantic Avenue, however.) There would be a that huge parking lot, for some 1044 cars, lingering indefinitely, rather than requiring everyone to use public transit or rely--as in actual downtowns--on extant commercial parking. Was new architect SHoP brought on to respond to widespread disapproval of the June Ellerbe Becket arena design that leaked? Yes. It's the same building. SHoP is just the façade architect. Is the arena costing much less? Not really. 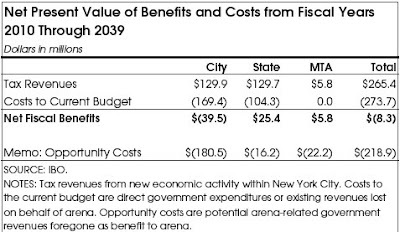 Remember, the arena was once supposed to cost $435 million, but escalated in 2008 to $950 million. When the Empire State Development Corporation issued the Modified General Project Plan in June, the arena was to cost $772 million, albeit without financing costs. In June, the arena was supposed to still be 850,000 square feet--remember, the project is supposed to be essentially unchanged--but now would be 675,000 square feet, without space for a major league hockey rink. Was Gehry dropped because his design was impossible? It's still expensive to build an arena. But it's more expensive to build an arena and four towers around it in four years. Whatever happened to state Senator Bill Perkins's questions about the Brooklyn Arena Local Development Corporation (BALDC)? I asked Perkins in January, and he said he was awaiting an answer from Attorney General Andrew Cuomo. I asked again yesterday and am awaiting a response. Has the fight against the project been fought mainly by residents and property owners in the AY footprint? No. While only those individuals could serve as plaintiffs in the eminent domain case, coalitions of numerous community groups have challenged the environmental review and General Project Plan, and funding for the lawsuits has come from people and groups in the surrounding neighborhoods. Have project opponents been nasty or disruptive? Have proponents? Opponents have occasionally heckled at public hearings. Proponents have not only done the latter, they've temporarily shut down a state Senate oversight hearing and an ESDC-mandated informational meeting. Do all of the groups that signed the Community Benefits Agreement (CBA) receive funding from the developer? What does Mayor Mike Bloomberg--once an enthusiastic witness to the Atlantic Yards CBA--now call CBAs? Does the CBA, including funds for job training and efforts to hire minority and women contractors, represent a cost to the developer? Yes, but, consider that additional public subsidies, such as the recent transfer of $31 million from the city for purchasing land in the arena block, make it much easier for the developer to seem generous. Does Forest City Ratner seek more subsidies? They said so two years ago, and that's likely unchanged, given the need to pay for infrastructure and build affordable housing. Did Forest City Ratner bail out national ACORN to the tune of $1.5 million? Yes. It got only belated coverage. Do polls support the project? Not originally. Just after the questions changed. It likely has to do with questions were framed: people were wary of government support for a sports facility but were willing to support a larger project that would "provide" affordable housing, with no mention of the scarce subsidies and public costs. Did any local elected official have a voice in the project? No, since the state and city agreed that it would bypass the city's Uniform Land Use Review Procedure, which involves nonbinding votes by Community Boards and a vote by City Council--a process used in the Columbia University expansion, also an ESDC project. The three affected Community Boards all expressed opposition or significant concern and said that FCR overstated their participation in the CBA. Will local elected officials show up at the groundbreaking? Good question. Many of the elected officials who've showed up at public hearings come from farther out in Brooklyn, have gained financial support from the developer, and have longtime ties to FCR VP Bruce Bender. As arena construction proceeds, will project opposition continue? Develop Don't Destroy Brooklyn (DDDB), which has organized and raised money for lawsuits, now sees that primary activity ending and lead spokesman and plaintiff Daniel Goldstein will have to move from the footprint. DDDB activists must decide whether the group can continue to play a role. Other groups, such as BrooklynSpeaks (which has been advocating for a new governance structure) and the Council of Brooklyn Neighborhoods, are likely to persist in a watchdog role.